I never used to like coleslaw. Memories from my childhood are of KFC dinners my Dad brought home, complete with mashed potatoes, gravy, rolls and soupy slaw. Ick. Many years later, I ate coleslaw at a restaurant, and loved it! Nothing like that drippy, wet slaw made in bulk. I set out to create my own version of grown up slaw at home. Apple and Cabbage Slaw. 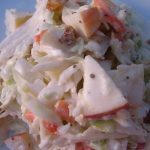 Fresh fruit and chopped cabbage mixed with a bit of tangy mayo and celery seed is my perfect at home slaw! You’ll never turn your nose up to slaw again. Promise. Wash and chop cabbage. Place cabbage in large bowl. Add carrots, apples, golden raisins, and Craisins. In separate bowl, mix the mayo, cider vinegar and sugar until the sugar is dissolved. If you like the dressing more tart, add vinegar, a tablespoon at a time. If you like your slaw dressing sweet, add more sugar. When the dressing is mixed well, add the celery seed. Pour the dressing over the cabbage and fruits. This salad is best when chilled for at least an hour. I've made this recipe many times and LOVE it every time. I'll make it today. I have made so many of your recipes since Christmas, after following a link from Mint Arrow. I love your blog and spam so happy to have found you. 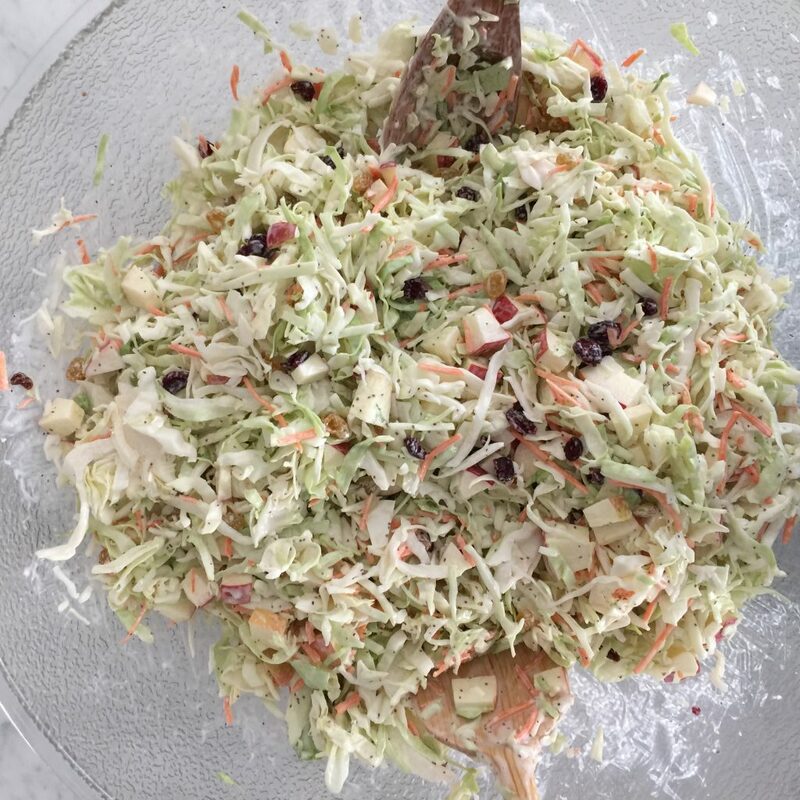 Made this slaw last week despite it being the dead of winter here in NJ – pregnancy craving probably. It is delicious. I used two tbsp of sugar in the dressing and may go just a tad less next time. Thank you!